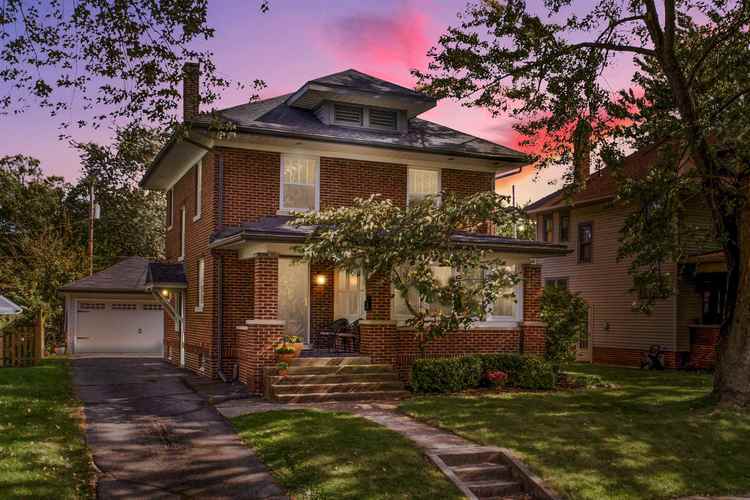 Enjoy the charm of this 1920's all brick four square on one of the best streets in 46805 while enjoying updated amenities and a surprisingly open layout. One of the few homes with a driveway from the street, it leads you to an oversized 2 car garage. The adorable backyard is fully fenced and includes raised garden beds and a stamped concrete patio. Enjoy the convenience of the smart lock from the detached garage so that you don't have to fumble with the keys. The open main level is engineered hardwood with a classic staircase and sunroom. The kitchen opens to the dining room and includes stainless steel appliances with modern cooktop and hood with subway tile backsplash to the ceiling. The basement has a very usable living space plus room for storage and a new bathroom added to the home. The bedrooms and closets are refreshingly good sized. The bathroom stays true to the time period of the home with octagon tile floors and pedestal sink. The bath was recently update with storage vanity with granite tops and new tub/shower. New dimensional shingles were added in 2017 and the home comes with an HMS home warranty. Walk to your favorite coffee shops and neighborhood restaurants and enjoy the short trip down Forest Park Blvd to Lakeside Park and all of the excitement of downtown Fort Wayne. Directions:From State turn North on Forest Park Blvd. at the end of the street veer left to West Drive. Home is on right.